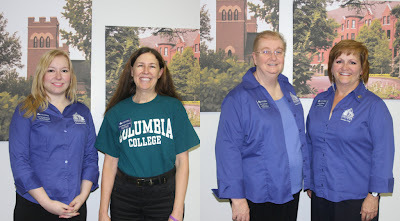 spirit by donning Columbia College colors and gear. College Colors Day is an annual celebration dedicated to promoting the traditions and spirit that make the college experience great by encouraging people across America to wear apparel of their favorite college or university throughout the day.Additionally, College Colors Day, which coincides with “back to school” and the kick-off of intercollegiate athletics, strives to advocate higher education through increased public awareness, and celebrates the achievements of colleges and universities, acknowledging their fundamental importance. Since its inception in 2005, College Colors Day has grown rapidly across the country. Thousands of organizations and millions of individuals participate annually by donning their team colors and sharing in the college spirit with friends and colleagues.